In the UAE, air quality is one of the key issues in the UAE National Vision 2021 agenda, with an aim to raise air quality from its current level to 90% by 2021. With this in mind, the Ministry of Climate Change and Environment together with its public and private sector partners has established strategic plans for each emirate and has implemented sustainable development goals (SDGs) to meet targets set by the United Nations for 2030. In addition, the UAE has committed more than USD 840 million (AED 3.1 billion) to renewable energy in more than 30 countries. 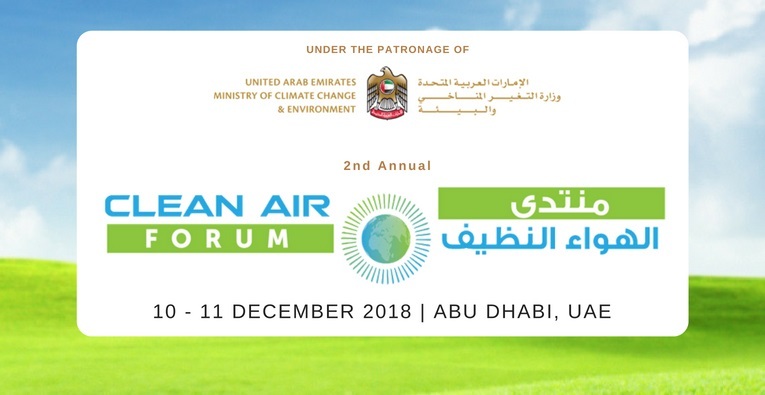 With air pollution control at the forefront of the national agenda, the Clean Air Forum 2018 will bring together key stakeholders to discuss the latest regulations for improving air quality control, innovative technologies for conserving energy and reducing air pollutants, benchmarking with international best practices for air pollution control, and exploring green, clean and efficient energy sources.